As we all know, girls usually have more style options on a daily basis than guys because girls just simply have more clothing choices. However, for weddings I think it may be the other way around! Yes, brides have tons of style choices for their dress, but typically they only wear white and they don't have as many bold accessory options. Whereas, the men have a plethora of options! From the color to the type of suit, to the fabric, undershirts, suspenders, bow ties or no ties, the have so many options! And if you're really wild, bold shoes. 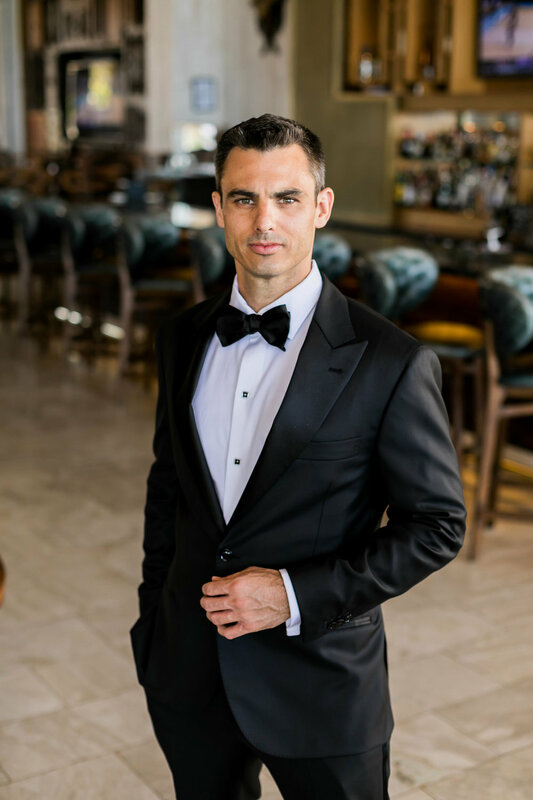 Since men have so many style options for weddings, we decided to put together a few of our favorites we've seen men wear here in Cabo! These guys radiate style! Their suits might look simple and nice, but if you look at the details, they start to stand out! Jesse is one of our all time favorites with his lightning bolt collar pins, his colorful accents on his tie and pocket square, to his funky shoes and retro shades. His style pops! Braden has a very tasteful suit with detailed fabric and a stylish lapel flower that matches his pocket square thanks to The Tie Bar and his great taste of course! These lovely gentlemen are our other favorites. They are so classy and sharp! From their button downs to their bow ties. These guys have style like no other. Their suits have beautiful detailing that make a simple suit elegant. Even their bow ties are detailed! You can never go wrong with a bow tie! We love how playful they can be. Wearing a button down with a pop of color is a nice choice! It spices up the look without even having to wear a tie! It's a perfect style choice for a beach wedding. When it's a little cooler here in the winter months, wait coats are a great choice. They are so classic, they'll never go out of style! TREND ALERT. We have had multiple weddings super recently where the fella's have been wearing suspenders, which means we don't have the photos back yet. But, since there have been so many lately, this is the obvious new trend to keep in mind and we love it!